Home MBA MBA Dissertation Recruitment and Selection at Fibremarx Paper Ltd. Recruitment and Selection at Fibremarx Paper Ltd. 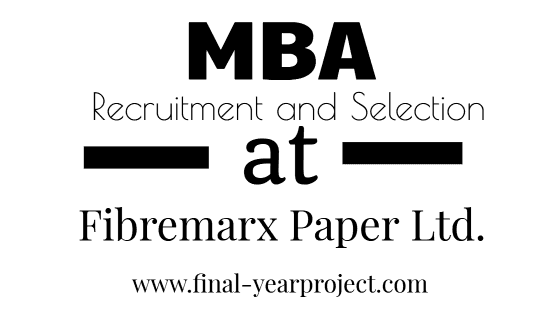 This MBA project studies the "Recruitment and Selection at Fibremarx Paper Ltd. Kashipur" and attempted to provide some ways of recruitment and selection with the help of company profile. Human resources are the most important assets of the company. They can make or break the fortune of business. Without an effective congenial environment, any company cannot survive and the people who are working in the organization would not provide our full attention. This report provides the platform to leverage authors potential in the most constructive way. You can also subscribe to FINAL YEAR PROJECT'S by Email for more such projects and seminar. In today’s rapidly changing business environment, organizations have to respond quickly to the requirement for the people. Many private players have entered the economic market thereby increasing the level of competition. In the competitive scenario, it has become a challenge for each company to adopt practices that would help the organization stand out in the market. The competitiveness of a company an organization is measured through the quality of product and services offered to customers that are unique from others. Fibremarx Paper Ltd. is a modern paper manufacturing company with its base in Uttrakhand India, considered to be the motherland of paper. It is a professionally run company managed by a group of directors who are individuals of high professional integrity and extreme business acumen having had long innings in business circles and who believe in leveraging. Most of the HR practices of Fibremarx Paper Ltd. are a result of the vision of its founders and the culture that they have created over the years. The founder advocated simplicity and maintained the culture of the company. The workers are motivated to share the learning experience. FIBREMARX PAPER LTD was the first company to provide the employees with world class facilities for training and working. The overall aim is "to obtain at minimum cost the number and quality of employees required to satisfy the human resource needs of the company". Further, this report discusses about Paper making process in the paper mill, selection & recruitment, Employment interview, recruitment strategies and processes, Questionnaire, etc. Use this report for your reference and study purpose.